The U.K. based market research firm YouGov has published its list of most-admired global brands, based on a multicountry survey, and the results are shown in the graphic at the left. These results prompt me to make several observations. First, it is noteworthy that Samsung's ranking is based in part on massive advertising and marketing expenditures that far outpace other companies on the list. As reported by Reuters Samsung Electronics in 2013 was expected to spend more than $14 billion on advertising and marketing, an amount that exceeded Iceland's GDP. Second, as observed by YouGov BrandIndex CEO Ted Marzilli, “Technology and internet brands transcend national boundaries and provide products and services that impact people’s daily lives. 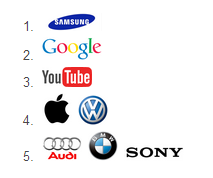 Whether it is technologies made by Samsung, Apple and Sony, or the wealth of information and videos made instantly available by Google and YouTube, these companies shape modern life and connect people from around the world, making them some of the most powerful global super brands.” In this regard it is worth noting that if YouTube, owned by Google, were combined with its parent company, Google would be the number one brand in the world. Third, as I've noted before, many people in the U.S. and other major markets around the world do not identify Samsung as a "Korean" company. Equally as important, Samsung's marketing communications do not emphasize its identity as a Korean company. Those who consult this blog regularly will know that I am very interested in the relationship between corporate and brand image. (see numerous posts relating to this topic here) Earlier this week the Chosun Ilbo reported that "North Korea is the first thing that comes to the mind of foreigners when they think about Korea." This was based on a 50-country survey by the Presidential Council on Nation Branding in cooperation with the Samsung Economic Research Institute. As I've discussed in earlier posts, this corresponds with patterns of global web search attention revealed by Google Trends.